International lawyers want Burma to lift the death penalty imposed on the two men who murdered a human rights lawyer. U Ko Ni — a former adviser to Aung San Suu Kyi, Burma’s state counsellor and de facto leader — was shot in broad daylight at Yangon International Airport in January 2017. Governments and human rights groups demanded that his killers be brought to justice and police quickly arrested two men, who were found guilty of Ni’s murder and sentenced to death. 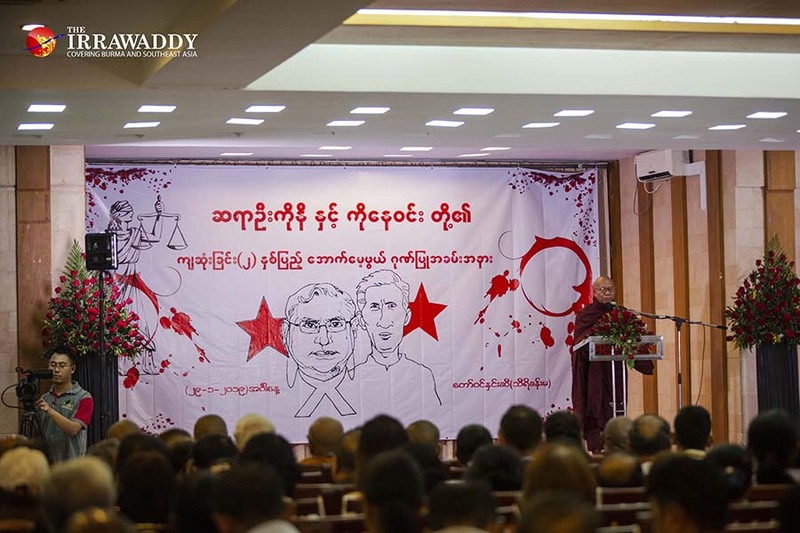 State Counselor Daw Aung San Suu Kyi urged authorities to find justice as soon as possible for prominent constitutional lawyer U Ko Ni and taxi driver Ko Ne Win, two years after they were gunned down in Yangon. U Ko Ni, a legal adviser to the ruling National League for Democracy (NLD), was gunned down at pointblank range outside Yangon International Airport on Jan. 29, 2017. Ko Ne Win, a taxi driver at the scene, was killed by the same gunman while chasing after him. The 63-year old lawyer was an expert on the military-drafted Constitution and came up with the idea of creating the position of state counselor to get around a clause in the charter effectively banning Daw Aung San Suu Kyi from the presidency. He advocated for changes to the Constitution that would strip the military of its undemocratic privileges; many believe those efforts led to his death. “I would like to urge the concerned authorities to find speedy justice for Saya U Ko Ni and Ko Ne Win, who both sacrificed their lives to help fight the challenges to promoting the rule of law and justice in Myanmar,” she said. To date, 72 prosecution witnesses and 40 defense witnesses have appeared in court over the course of 101 hearings in the trail of U Ko Ni’s accused assassins — gunman Kyi Lin and alleged conspirators Zeya Phyo, Aung Win Zaw and Aung Will Tun. A verdict is expected after the defense makes its closing argument on Friday, prosecution lawyer U Nay La told The Irrawaddy. Prominent #Burmese lawyer and an expert on constitutional law, U Ko Ni’s case will be sentenced on February 15, after long 101 court sessions, the court says. He was assassinated at #yangon international airport #Myanmar, on 29 January 2017. U ko ni killing case. Lawyer u nay la talks. A Yangon court will soon deliver judgment against four men on trial over the killing of NLD legal adviser U Ko Ni, while the alleged mastermind remains at large. TWO YEARS after the brazen assassination of prominent lawyer U Ko Ni at Yangon International Airport, the failure of the Myanmar Police Force to arrest the alleged mastermind continues to attract public criticism. Final arguments by lawyers representing the four men arrested over the killing are due to be presented in Yangon Northern District Court on February 1, almost two years after the hearings began in March 2017. Ko Ni was a constitutional expert, legal adviser to the National League of Democracy and prominent Muslim public figure. He has been credited with masterminding the state counsellor position for Daw Aung San Suu Kyi, which allowed her to assume high office in the face of the military-drafted 2008 Constitution, whose provisions barred her from the presidency. Ko Ni was shot dead while cradling his grandson outside the airport late on the afternoon of January 29, 2017. He had just returned from Indonesia where he had participated in a leadership programme on democracy and conflict resolution as part of a delegation headed by the Minister for Information U Pe Myint. The suspected mastermind of the assassination, U Aung Win Khine, 47, who faces a charge of premeditated murder, has been declared a fugitive from justice by the court. He is the subject of an Interpol “red notice” issued at the request of the Myanmar police. The suspected gunman, U Kyi Lin, was arrested almost immediately after the killing. He is also accused of fatally shooting a taxi driver while trying to flee the airport. He has been charged with premeditated murder and the illegal possession and transport of firearms. Yangon Northern District Court has set February 1 for final arguments by defence lawyers in the long-running trial of four people accused over the killing of lawyer and constitutional expert U Ko Ni two years ago. The final arguments will follow testimony from the defendants’ witnesses. Ko Ni, a legal adviser to the National League for Democracy, was shot dead outside Yangon International Airport on January 29, 2017. The court had scheduled defence witness Police Colonel Win Min Thein, who is involved in airport security, to testify on January 18 about an alleged meeting with suspected co-conspirator in the killing, Aung Win Zaw, and accused mastermind Aung Win Khine, at about the time Ko Ni was shot. However, Win Min Thein, who failed to appear for a second time on January 18, told the court by letter that he did not want to testify because he did not know everything about the case. The court then decided to have Win Min Thein removed from the list of defence witnesses, despite objections from Aung Win Zaw’s lawyer, U Aung Khine. A number of key witnesses surrounding the assassination of National League for Democracy’s legal advisor U Ko Ni are yet to testify in court despite the 100th hearing having taken place on Friday. The 63-year-old lawyer was gunned down at Yangon International Airport two years ago this month. So far, four suspects—Kyi Lin, Aung Win Zaw, Aung Win Tun and Zeya Phyo—have been arrested and brought to trial though Aung Win Khaing, believed to be the mastermind behind the conspiracy, remains at large. He was last seen in Naypyitawin February 2017. Since the beginning of the trial in March 2017, almost all witnesses for the plaintiff have testified in court. Despite witnesses for the defendant beginning their testimonies in July 2018, some key witnesses are yet to testify—including the police colonel who was chief of airport security at the time U Ko Ni was gunned down. Another is the wife of the accused Zeya Phyo. Police Col. Win Min Thein, deputy chief of the Yangon Police Force, has yet to appear in court despite being summoned three times, each time giving the excuse that he is too busy to attend court. One of the accused, Aung Win Zaw, revealed in his testimony last year that he and his brother, Aung Win Khaing, had met with the police colonel for “some business” shortly before the lawyer’s assassination on Jan. 29, 2017. In Friday’s hearing, another three witnesses submitted by Zeya Phyo didn’t appear in court, causing the judge to remove their names from the witness list. If the remaining major witnesses, including Win Min Thein, fail to show up for hearings in the coming weeks, they are also likely to be dropped from the list. As Ko Ni walked out of Yangon International Airport on a warm January afternoon in 2017, the legal adviser to Myanmar’s ruling party had reason to smile. A prominent member of the country’s marginalised Muslim minority, Ko Ni had been receiving death threats for months. He was treading a perilous path in Myanmar: openly calling for reforms meant to reduce the military’s dominant role in government. But his political idol, the Nobel Peace Prize laureate Aung San Suu Kyi, was in power. And so, he continued to work to squeeze the generals out of politics. In the weeks after Ko Ni’s murder, three former military officers were accused by police of organising his assassination by a hired gunman. Two have pleaded not guilty to murder at a trial in Yangon expected to end in the coming months. The third has evaded capture. The gunman admitted shooting Ko Ni, but says he acted under duress. No evidence has emerged that active military officials ordered the killing. The Myanmar authorities must immediately and unconditionally release human rights lawyer Khin Khin Kyaw, who has been convicted of “contempt of court” and sentenced to six months in prison in connection with her role as a defense lawyer, said Amnesty International today. The conviction and imprisonment mark yet another blow for rule of law in Myanmar and sends a worrying message to human rights defenders across the country.